In the wake of Bill Kristol’s bold declaration that “Rudy’s Running,” our friends over at The Atlantic have compiled a handy timeline of five of the pundit’s most hilariously wrong predictions. The problem is, we think they’re selling him a bit short: he’s about as accurate as a Ouija Board. 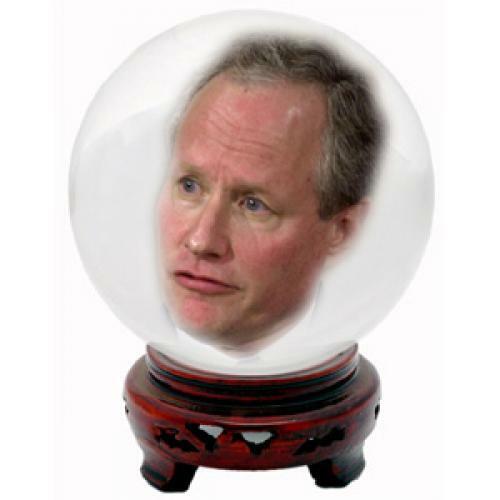 Let’s peer back into our Kristol Ball for more examples of prophecies unfulfilled. In November 30, 2005, Kristol wrote “All this made me think the 2006 elections could result in a Speaker Pelosi. I now think that unlikely.” Bill should have stuck with his gut. In September 2007, Kristol hinted that a Fred Thompson-David Petraeus ticket would bring it home for the GOP in the general election. Nobody else thought so — especially not Thompson and Petraeus. Oh, and on election night, Kristol predicted McCain/Palin would win. After Arizona Governor Jan Brewer passed a draconian anti-immigration bill in 2010, most constitutional lawyers expected a quick judicial override. But on April 25, independent-minded Kristol predicted that it would survive the courts, claiming, “I doubt it violates the Constitution.” The day before the law was scheduled to go into effect, the US Department of Justice issued an injunction. In addition to seer, Kristol is also a mercantilist. On January 19, Kristol wrote, “I predict we will see…a modernized international gold standard.” Now, to be fair, this one could come true, but barring apocalypse, most economists find Kristol’s forecast is ludicrous. March 28, 2003: Look, I would be shocked if we don't find weapons of mass destruction. April 4, 2003: There's been a certain amount of pop sociology in America ... that the Shia can't get along with the Sunni and the Shia in Iraq just want to establish some kind of Islamic fundamentalist regime. There's almost no evidence of that at all. Iraq's always been very secular. April 28, 2003: The battles of Afghanistan and Iraq have been won decisively and honorably. Turns out when you make wild, ideological guesses from a high perch, people listen. And although a Hamilton study has confirmed that pundits are no better at predicting the future than a coin-flip, Kristol’s guesses are more like rolling a Dungeons & Dragons die. Take note GOP: As the primaries approach and Kristol foresees a resurgent Rudy and the repeal of Obamacare, the party might be better off with tealeaves.